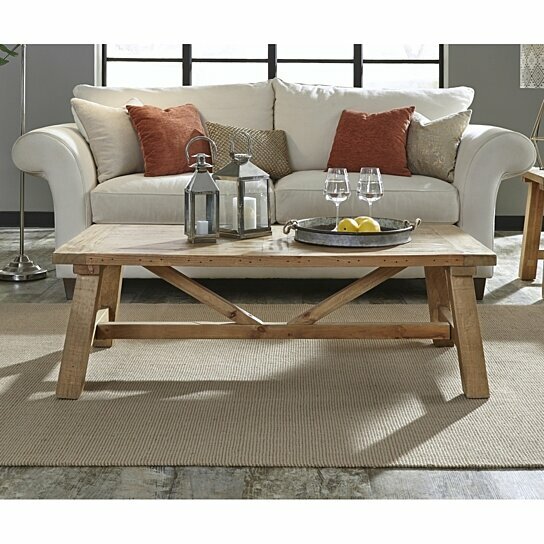 Whether you are looking for a relaxed cottage feel or a farmhouse vibe, this Coffee Table has got it all. Crafted from genuine salvaged solid pine shipping pallets milled into individual tongue and groove planks, this table features a trestle-reinforced sawhorse base that is engineered for superior stability and strength. Its rustic, tawny brown stain with a matte lacquer top coat brings out the characteristics in the wood, while natural color variance between planks and wood species ensures each piece is one of a kind. Set this coffee table at center of your living room to create a striking look and provide you with a spot to hold your drink, books or decors. Note: Other featured items in image except this coffee table are sold separately. The table features a trestle-reinforced sawhorse base that is engineered for superior stability and strength. Use the spacious top of this table to display decors and hold your drinks.